My initial experience in gardening started during the summers of my junior and senior high years at Kingwood Center, a local horticultural estate. I didn�t realize it at the time but the Director of Kingwood Center, Dr. Raymond C. Allen, who interviewed and hired me, was a charter member of the AHS. This early exposure to perennials and annuals, bed planting, shrub management, mulching, watering and fertilizing were very valuable experiences for me. Ownership of the Blueberry Patch, a u-pick fruit farm, with its involvement in greenhouse sales of annuals and perennials for over 20 years, provided yet more experience in growing and care of plants. It was during this period that Van Wade introduced me to hosta. Doug has a personal collection over 1200 named cultivars. 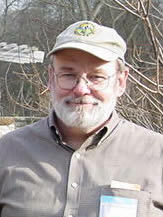 He is an original member of the FOoSF.com (Fraternal Order of Seedy Fellows) and has been hosta hybridizing for about 15 years. 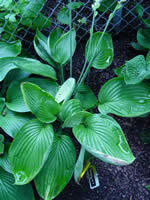 Hybridizing of hosta started with growing OP seeds in the mid 90's. Each subsequent summer, designed crosses were made and the following fall and winter, seedlings were grown and culled. The month of May results in planting the seedlings outside in-ground or in pots. Eventual evaluation 10 years later, has lead to my first 6 registrations in 2007. Currently, I collect 40,000 � 60,000 seeds in the fall, (both OP and designed crosses), which result in approximately 2000 seedlings, that are planted in raised beds for a 2 year trial period. The plant shown along this article is H 'Dream Boat' (2009) which is now in TC. As you can see it takes a long time to produce a hosta. Our interest in hosta led us to the American Hosta Society and its annual convention. We have been very fortunate to get to the last 12 in a row. I have been elected to the National Executive Board as VP Honors and Awards of the AHS, and most recently have been elected as Executive VP conventions coordinator of the AHS. Our garden in Mansfield, Ohio was on the alternative day tour for the National convention in 2005. The PPA toured our garden in 2007 as well as approximately 10 garden clubs per year. We love to have clubs and friends visit us. In an attempt to help spread the word on our beloved hosta, I have spoken to many locals, regional, and recently the National Convention on the how-to of hybridizing. It is very gratifying to show people how easy it can be to hybridize and then see them do it.